Born in Calgary to George and Janet Dickson, John grew up in Vancouver’s Dunbar area, where he attended Lord Byng Secondary School. Some of his early activities were Scouts and family vacations up to Bridge Lake in the Cariboo. He went to UBC and earned a Bachelor of Arts and a diploma in special education. While attending university, John worked at a paper mill on Annacis Island, and summers took him in search of employment far from Vancouver, including work in mines and construction in the Yukon. In 1972, John moved to Terrace, BC, where he worked on the greenchain for Skeena lumber. This was short-lived as he soon accepted a position as a social worker and did this until he returned to Vancouver in 1975 to finish his bachelor’s. He then settled into teaching in Terrace, first for Thornhill and later Cassie Hall. While in Terrace, his three children, Cathy, Leslie, and Mike, were born. 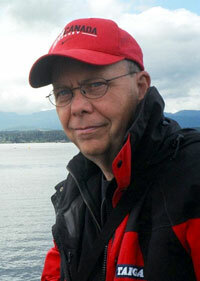 In 1983, John moved to Prince Rupert, BC, for a position with Skeena Broadcasting, before returning to teaching. John took the motto “lifelong learner” to heart, devoting most of his professional life to education. He embraced his teaching job at Prince Rupert Senior Secondary for the special education department and facilitated many work experience opportunities for Prince Rupert youth with disabilities. His dedication was evident when he took his entire class to the Calgary Olympics in 1988 (financed by John’s school pop machine proceeds). After completing his master’s in education, John became a vice principal, then a principal, first in Port Simpson, then in Prince Rupert, where he met and married Carole. After retiring, in 2003 John and Carole moved to Comox, BC, a place they both grew to love. His retirement was short-lived as John became a professional volunteer. He gave his time to many local groups, including Elder College, CFYC and Meals on Wheels, and was one of the founders of the Comox Dinghy Sailing School. An enthusiastic amateur athlete, John loved to play baseball, tennis and even basketball when he could convince his family to play. He doggedly worked on his golf swing and perfected his turns on many ski hills over the years. Family was incredibly important to John. He was a wonderful husband, a supportive and engaged father, a caring brother and a true friend. He will be missed tremendously.